Please note that all delegates are responsible for their own travel, accommodation and travel insurance requirements. Please see some information below to assist in making appropriate arrangements. The Australian Department of Home Affairs has a Visa Finder service to assist you in determining the appropriate type of Visa to meet your travel needs. For more information about the visas available for visiting Australia or extending your visit, please refer to Visitor visas. *Disclaimer – It is the responsibility of conference delegates to ensure they apply for and obtain a Visa appropriate for their individual circumstances before travelling to Australia. This information is general only, as at 15 August 2018. Adelaide Airport is only 7 kilometres (km) from the city centre. Adelaide Metro operates the JetExpress bus service between Adelaide Airport and the city. A taxi fare calculator is available here. Many of these hire companies also offer cars for hire from within the CBD. Please note that a yellow fever vaccination certificate is required from travellers over one year of age, entering Australia within six days of having stayed overnight (or longer) in an infected country (with the exception of Galápagos Islands in Ecuador; the island of Tobago; and limited to Misiones Province in Argentina), and for travellers having transited for more than 12 hours through an airport of a country with risk of yellow fever transmission. Venomous snakes and spiders exist throughout Australia and can be extremely dangerous. Although uncommon, almost all snake bites occur when people try to handle, kill or harm a snake. You should seek medical assistance immediately if bitten. Australia uses decimal currency with the dollar being the basic unit (100 cents equals 1 dollar). Foreign currency exchange facilities are available at Adelaide Airport, all major bank branches and several specialist outlets. Visa, Mastercard and other electronic payment systems are commonly used in Australia. The Goods & Services Tax (GST) in Australia is a value-added tax of 10 per cent, applied on most goods and services. The GST amount is normally included on price tags shown on products or menus but will be shown separately on receipts and invoices. Using the Tourist Refund Scheme (TRS), international visitors can claim a refund of the GST that is paid on goods in Australia. The refund only applies to goods that are taken out of Australia. The Department of Home Affairs website has the answers to several frequently asked questions. Tipping is not the general custom in Australia. Tipping in restaurants is not necessary, but appreciated for good service. Mains voltage in Australia is 240V at 50Hz. 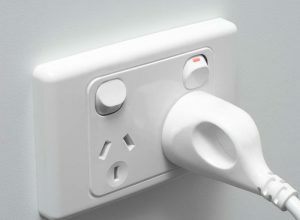 The Australian three-pin power outlet is different from most other countries – an adaptor will likely be required.